This morning I got up to get the children ready for school. One by one they came into the kitchen to get their breakfast. Suddenly Timmy came with a painful expression on his face. 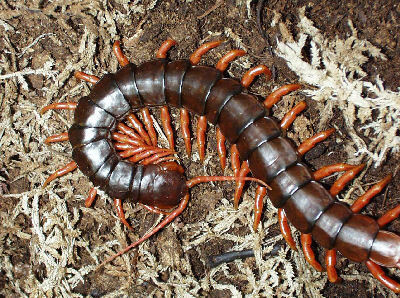 On the kitchen floor a huge Centipede was running for a corner. It was about 15 centimeters long. It was the same species as this one a Vietnamese centipede or “Scolopendra subspinipes” They have a serious bite and i heard Thai people saying they can kill a baby with their bite. I don’t know if this is true. Luckily the centipede kind of bit into Timmy’s toe nail and could really dig in. so with some ice and Fenistil gel we got the pain in check. The last days were so hot it was getting to me. I could sense it in the traffic. I mean driving in Thailand is very dangerous as it is. But when it gets so hot over many days we all get short tempered and traffic becomes even worse. Two days ago there was an accident on Hang Dong road when I was driving home around six. I saw a Pick-up Truck that slammed earlier into a Electricity pole killing all for passengers. The driver apparently was drunk. Yesterday afternoon the clouds were building up. Sometimes it is hard to see because of the pollution that is closing up the sky here in Chiang Mai. But suddenly it started raining, and the it even hailed for a moment. Very strange. It went on with a heavy downpour for a while. It rained more or less the whole night. So this morning Chiang Mai is reborn with clear fresh air. What a treat for us living here in this heat. Ich habe vor ein paar Tagen Pixelmator runtergeladen. In den letzten zwei Jahren habe ich immer wieder das Internet nach einem Program abgeklappert mit dem ich Photos bearbeiten kann. Photoshop ist mir einfach zu profesionel (zu kompliziert 😉 für mich). Das meiste das ich ausprobiert habe hat mich nicht anngesprochen oder war mir nicht intuitiv genug. Wenn ich inerhalb einer Stunde kein angemessenes Resultat vorzeigen kann frustiert mich es mich und ich gebe auf. Die Programme die ich auf meinem Mac habe sind einfach und schnell zu begreifen. Natürlich sind sie auch limitiert. Für meine Zwecke reicht es aber vollkommen. Pixelmator kostet 59$. es kann aber als Vollversion heruntergeladen werden. Die bearbeitetn Bilder haben dann einfach ein Wasserzeichen. Wie momentan mein Banner oben im Blog. Das Programm hat mich bislang von der Aufmachung begeistert und von der Einfachheit der Benutzung. Ein plus ist das die iphoto lybrary in Pixelmator zugreifbar ist. Ich muss also nicht die Photos aus dem iphoto exportieren und dann in den Pixelmator importieren. Ich werde noch einwenig mit dem Pixelmator herumspielen bevor ich eine Entscheidung treffe ob ich es kaufen soll. In our old house we used to have a nightly visitor. A big colorful Gecko. At least I think it is a Gecko. Thais call them Too-keh. They are very beautiful but also scary. I was told that when they bite they won’t let go. Now having moved I realized that we again are proud owners of a Gecko coming out at night to hunt insects and scare our cats. One night the mother cat was screaming and being all upset after having an encounter of the Gecko kind. They are really not that small. This one is 40 cm. long. It stays hidden during the day and runs around the house walls at night. The worst that could happen though is when you open the kitchen door in the back and that thing falls on your head. It is 38 degrees here in Chiang Mai and in our house it is over 30. How can any normal person work in these conditions. Living here for so many years I still have a hard time with that kind of heat. Global warming here I come. We moved house a month ago and I must say it is cooler here then the old place. Still I wish I could lay at the beach right now and not having to think of studying and working. It is Saturday again and the whole family crashed in the living room to watch a video. Surfs up was the right joice. I love that movie about a pinguin in the arctic who wants to become a surfer dude. I wish I could be at the beach right now. The part of beach they show looks just like Phi Phi in Thailand. Tomorrow Lillian and I are leading worship in the German church gathering. It is held in an open house. This morning I practiced some new (actually old) songs. I hope tonight it will cool down a bit. So it want be too while we are playing.